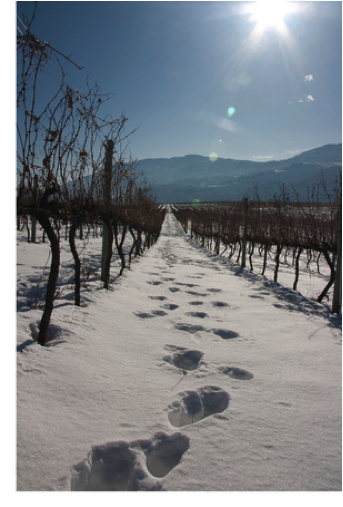 Discover a winter wonderland in Oliver Osoyoos Wine Country this November 29th and 30th. The South Okanagan will sparkle with seasonal events as part of the annual Winter in Wine Country festival. There will be 27 wineries hosting festive favourites such as carol singing, special tasting room opportunities and fabulous displays of Christmas lights. During the weekend of Saturday November 29th and Sunday November 30th the following wineries will be taking part: Adega on 45th, Black Hills, Burrowing Owl, CC Jentsch Cellars, Cana Vines, Castoro de Oro, Church & State, Culmina, Desert Hills, Gehringer Brothers, Hester Creek, Hidden Chapel, Inniskillin, Intersection, Jackson-Triggs, Maverick, Moon Curser, Nk’Mip Cellars, Oliver Twist, Platinum Bench, Quinta Ferreira, Road 13, Rustico, Silver Sage, Stoneboat, Tinhorn Creek and Young & Wyse. As a special treat, Landsea Okanagan Tours & Charters is offering three tours on November 29th and 30th at a ‘Locals Appreciation’ rate of $25 per adult and $5 per child (age 4-18) including taxes. Children three and under are free. Families will love the four-hour Rudolph Route with a range of child-friendly activities such as tree decorating, carnival games, a bonfire and light up party (Saturday and Sunday). For foodies and wine lovers alike, join the four-hour Blitzen Route for red wine and chocolate pairing, slices of warm and buttered Christmas bread and fresh-baked artisan breads, holiday soup, cookies and mulled wine (Saturday) or stimulate all your senses on the four-hour Vixen Route with food and wine pairing, live entertainment, a bonfire, dessert wine pairing and a light up party (Sunday). For more information please visit the Oliver Osoyoos Winery Association website: http://www.oliverosoyoos.com/Events/Winter-in-Wine-Country.